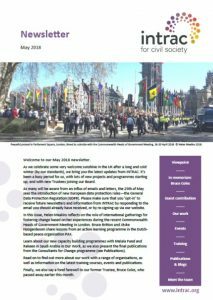 Our May newsletter contains information on some of the new work we are involved in, as well as bringing you up-to-date on a number of projects we have been working on. We have details of our forthcoming training courses, a viewpoint from INTRAC Chief Executive, Helen Mealins, giving insight into her attendance at the recent Commonwealth Heads of Government Meeting. There is also information on the June issue of Development in Practice, plus details of INTRAC’s partnership with Practical Action Publishing. Furthermore, we highlight our newest Praxis Series Paper No. 5 – Strengthening civil society through training national consultants, plus a new blog series by Nigel Simister.